Seventh grade students line up along the edge of Pickering Creek Environmental Center’s Farm to Bay loop, peering into the forest edge across the creek. An Osprey nest sits near the top of a Virginia pine tree, and students are waiting to see if they will catch a glimpse of the powerful fish-eating raptor, or perhaps a chick peering over the edge of the nest. Each year seventh graders come to Pickering Creek for a field experience called “Biodiversity Makes the Bay Better,” and spend the day searching for and counting as many different species of animals they can find within the mature forests and creek waters of the center’s 400 acres. There are over 3,600 species of plants and animals found in the Chesapeake Bay, from tiny grass shrimp to Great Blue Herons, from swaying cattails to towering tulip poplars. Described by one student as “the study of the complexity and diversity of living things,” biodiversity is a theme all 350 Talbot County seventh graders have focused on in their classrooms. Funded by generous donations from community members, Pickering educators lead a seventh-grade program that includes an in-school lesson about taxonomy, or the way organisms are classified. Working in pairs, students make observations on different physical features and adaptations of plants and animals and discuss the advantages of high species diversity, such as a greater number of natural resources, like food, being available for humans and other animals. Students learn that the more biodiversity in an ecosystem, the better that ecosystem can withstand change or disaster. During their field experience at Pickering Creek, the seventh graders get to discover for themselves many species that are found locally. Each activity students complete – fishing on the dock, hiking the trails with binoculars, pulling seine nets through the creek – is designed to bring them into contact with a new group of organisms. The species list, student-generated proof of local biodiversity, grows as each group adds their new finds to it. 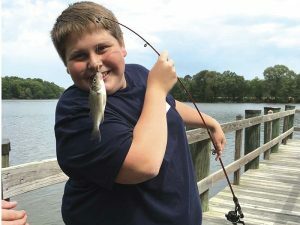 A seventh grader holds up a fish he caught during a biodiversity field trip at Pickering Creek. Leading seventh grade trips focused on biodiversity has multiple benefits: students build significantly on their knowledge of ecology, but also get the chance to explore and experience nature in an active way. Activities such as combing the forest for insects and seining in the creek are loved by students because it engages them fully, and it is fun. In the forest, students spread out to look under leaf litter, roll over decaying logs, and catch scurrying beetles in bug boxes. Often students find small worm snakes, toads, beetle larva and spiders on the forest floor. The experience is new for many of them, and they find the freedom to explore and catch things exciting. “I can catch that toad? Really?” asks one student. Similarly, seining in the creek is a chance for students to find something new, unexpected, or often unnoticed. One day in May students found over 40 individual grass shrimp in about 10 minutes. “That was really fun,” another student added after reluctantly leaving the creek and pulling off waders. At the conclusion of each field trip, students review their species totals. The Osprey did not appear at the nest, but one was spotted soaring overhead while the group was fishing off the dock. “Add it to the list!” shouted one seventh grader after seeing it fly around the creek’s corner. Students have found as many as 51 animal species in a single morning – proof of not only local biodiversity, but of the students’ engagement and persistence in finding all kinds of wildlife while visiting the center. This work has been supported by many community donors. Pickering Creek Audubon Center sees Eastern Shore students of all grade levels for hands on, standards-aligned environmental education programs in both classroom and field-based experiences. Educators and schools interested in developing a program for their students should contact the center at 410-822-4903.